I can claim citizenship of three countries – Canada, Ireland and Australia. But Australia is the most precious to me because it has been the land where I have enjoyed the most amazing opportunities. Few people know this, but I arrived in Australia at age five, as an assisted migrant from the UK, as a ten pound POM, born to parent with a serious but undiagnosed mental illness with the result that I became a neglected child, running and sometimes even sleeping in the streets at the age of seven. By my mid teenage years I was mixing with juvenile delinquents, and due to the stress I lived under, I was probably developing mental illness symptoms of my own. At age 15 I moved to a boy’s home in place of being charged and receiving a record for juvenile crime. But somehow from that background I completed school, attended university, I became a high school teacher, got married, had two kids, built a home, spent 16 years in the State Parliament, now I’m an Executive member of a NSW Government Department with 40 years of public service. I have met the Queen, twice, I have an album of selfies with almost every Australian PM since Gough Whitlam, I know every living Premier of NSW since Barry Unsworth and I count many of them as friends. By any measure, I have enjoyed a charmed life. I credit the Lord Jesus Christ for the healing and behavioral changes that needed to happen in my life before any of this was possible. 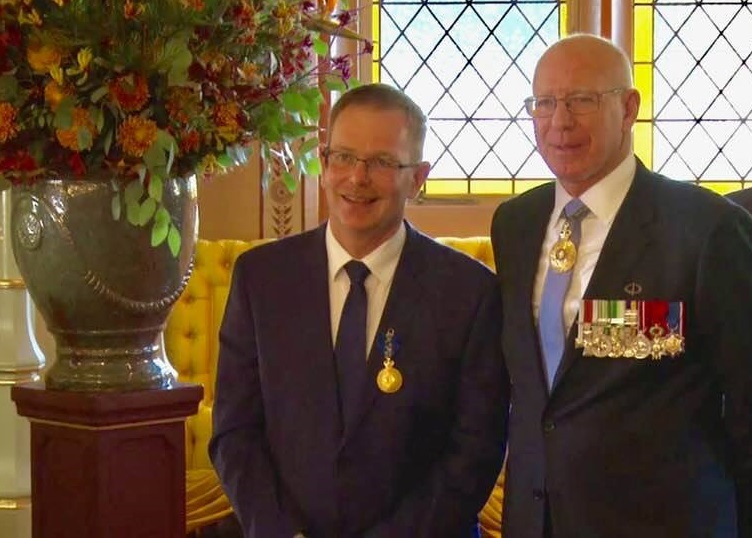 John Ryan, left, receiving his AM honour from NSW Governor David Hurley in 2018. But for the rest I thank Australia for being a land of incredible opportunity, in my view the sweet spot of the world. We not only have the world’s most enviable standard of living we have probably created the best material lifestyle in human existence. We had the choice of becoming either an indulgent welfare state like Europe, shouldering massive national debt and experiencing regular episodes of social unrest or following the American model where an excessive commitment to personal freedom provides great wealth for many but leaves millions without the benefits of aged pensions or health care. We have borrowed the best from those societies and avoided their problems. The greatest myth about Australia is that our greatness has come about by luck. That is a lie my friends. Our greatness wasn’t an accident, a quirk of history or luck based on mining. We have made our own luck. That’s what our founding mother Elizabeth Macarthur did right here in Camden. She took sheep breeds from around the world and made them something better. The Macarthur Merino is still the most commonly farmed sheep breed in the world. The main reasons that Australia is the joyous, free, reasonably equitable and very prosperous country we are today, where personal stories like mine are possible is because we have access to high quality education, abundant employment opportunity and our participatory democracy. In this enormous country of ours, you are never too small matter and you’re never too small to make a difference. I’m living proof of that, and so is Camden. I thank God for what we have and I pledge myself to work harder to build it, sustain it, defend it and pray for it, and hope that all of you that appreciate our amazing country will join me in doing the same with everyone who shares the same goals.